Currently we are using 29.3 version of metabase. We want to know how the filters work on custom SQL queries. But if we try to do the same thing using custom SQL query we are able to select the column but not able to get the values from that column and asking us to give the text value to apply the filter as shown in the second image in pdf. Can you suggest on this. Or should we use it in a different way to auto populate the values of that column. Also is this added in the newer versions? Attaching the image for the first case. I think you didn’t get the issue, I will explain clearly again. I attached my database to metabase. Now when I go the the table directly and select a column to filter the data based on values of that column, it auto populates the values in that column as shown in the comment image. 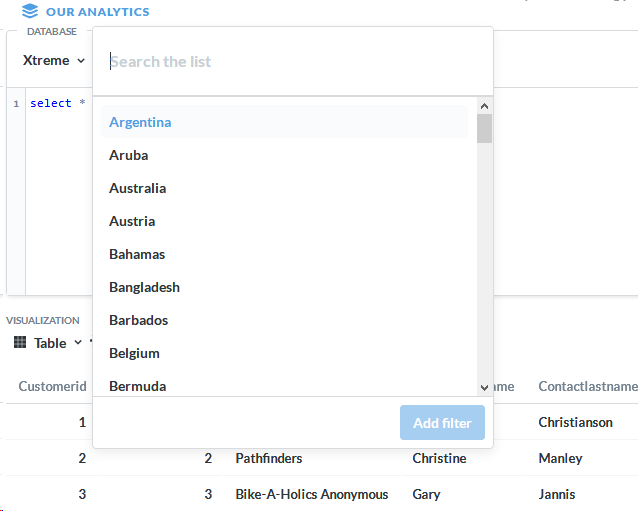 But when a write a query say "select * from " and now try to apply filter on column and then if I type the text I was not getting the auto populated texts for that column as shown in the original post image. Basically its about auto populating the column data when we try to search for a text in that column. Upgrade to the latest version an give it a try.